It is axiomatic that the quickest route to improve a strain is to breed related animals. Inbreeding, when coupled with selection for a desired trait, is unquestionably effective for increasing the frequency of progeny with desirable characteristics. Why, then, would I introduce a title that suggests the opposite? This betta’s spectacular halfmoon caudal fin is a trait that has come to dominate betta show circuits. Biological systems are notoriously complex. Even the simplest characteristic of an organism is a complex construction involving many thousands of chemical constituents. When we observe a trait that we find desirable in a fish, there are likely many different ways in which the form we find desirable may come into being. Genetically dissimilar lines of fish may then use different biological mechanisms to generate the same desirable trait. If so, then outbreeding your line to another proves the realistic goal of combining two routes to the same end. 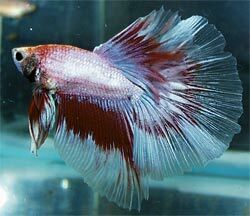 Consider the halfmoon caudal fin that is now the favored form of finnage seen in show bettas. The halfmoon is D-shaped with the outermost fin rays extending to the periphery and together circumscribing a 180-degree angle. A fin of this sort requires that a number of criteria be met for it to be defined as such. In particular, the outermost fin rays must be straight and of a length commensurate with that of other caudal rays, so that there is no bend at the tip or at the base of the fin. Clearly, the fin area must also be large, and this might be accomplished in a number of different ways. One way to create the 180-degree spread would be to increase the number of primary fin rays. Show bettas are often seen with as few as 10 fin rays or as many as 14 fin rays. Even with the maximal number of primary rays, the degree to which each primary array branches, and the position of that branching along the primary, can strongly influence the overall area of the caudal fin. Indeed, tertiary branching is typically the least one would expect to find in a halfmoon betta. The term “tertiary branching” refers to the condition where the primary ray has branched into two secondary rays, which have themselves branched into two tertiary rays, such that a single primary ray ultimately gives rise to eight ray tips at the caudal margin. Halfmoons with quaternary or more branching are not infrequent. A third route to producing the large caudal fin might be envisaged. The webbing between rays might increase. Indeed, unusually large inter-ray webbing is known in some crowntail lines, although I have never seen this trait exploited to increase webbing in halfmoon lines. Each of these routes to the halfmoon â€” through an increase in ray number, in fin branching and in webbing â€” might involve quite a number of different biological mechanisms. For example, the increased inter-ray webbing might result from a greater number of cells in the webbing in these fish or, conceivably, the cells themselves might be of larger size. Likewise, recent work on zebrafish has shown that fin ray branching involves the orchestration of several genes. One might expect that different alleles of these genes might underlie some of the considerable variation seen in branching patterns. The complexity of biological systems ensures that production of any structural feature involves multiple actors and hence any number of different routes to progress. Any genetic variation contributing to a trait is an opportunity to improve a line. Indeed, this claim is something more than a mere rule of thumb. Ronald Aylmer Fisher, a famous geneticist and evolutionary biologist working from the 1920s to the 1940s, is credited in many ways with demonstrating, through the use of various mathematical tools, that the sciences of genetics and of evolution were not only compatible, but in fact intimately interdependent in ways we now regard as conventional wisdom. George R. Price, an American population geneticist, substantially improved this formulation, for those interested, in what has become known as the â€œPrice Equation.â€ Both capture the key idea that the rate of improvement of a trait under natural selection is dependent upon the amount of genetic variation for that trait. For animal breeders the take-home lesson is simple: If rapid improvement is to be made, increase the genetic diversity available in the line. Since genetic variation equates to more biological routes to a desired end product, the breeder has the potential when using a genetically diverse line to improve that line by outbreeding. If there are distinct advantages to outbreeding, why would inbreeding ever be the appropriate course of action? A moments reflection will make this clear. When one breeds to a genetically distinct fish, the offspring not only gains the genetically desirable traits of the line, but inevitably inherits all its genetic weaknesses. This may be made clear in the context of our earlier discussion of halfmoons. Lets say that a breeder named Dan breeds great halfmoon greens, but these fish have the minor defect of bearing a slight red coloration in the ventral fins. Imagine a second breeder named Sieg who also breeds exceptional green halfmoons, but Siegs fish have a minor defect of having colorless pectorals. Now Sieg and Dan trade fish, figuring correctly that great halfmoon caudal fins in the two lines are probably achieved by different genetic mechanisms, so that by outbreeding to each others lines they will get some truly exceptional caudal fins. What is likely to happen is that they will indeed get a few fish with truly exceptional caudal fins, but may well find that these same fish have red on the ventral fins and colorless pectoral fins. That is, outbreeding is equally likely to combine undesirable traits as it is to combine desirable traits. So, there is an enormous downside to outbreeding. A high-quality line can inherit the defects of another line and be ruined. Is there a way to obtain the benefits of outbreeding while avoiding its costs? The answer is yes. If one outbreeds to obtain genetic variation and follows this with several generations of inbreeding, wherein the breeder selects for the desired traits and selects strongly against the negative traits, the net effect of the original outcross will be to move only those desired traits into the line. The job of purging a line to remove it of undesirable traits may prove difficult, indeed sufficiently so such that outcrossing should only be made to lines of similar or higher quality than oneâ€™s own.